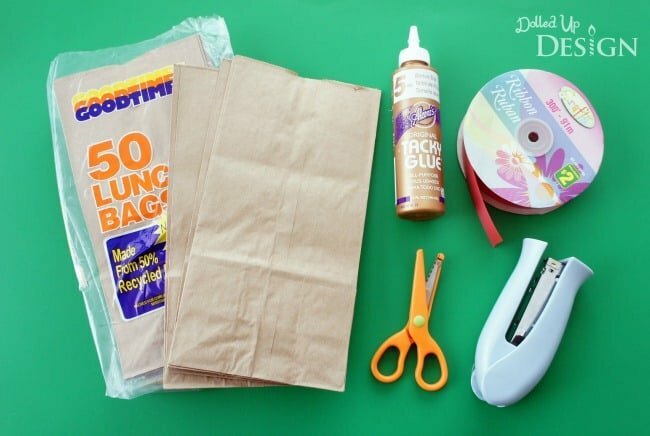 This Paper Bag Picnic Baskets post is courtesy of our contributor Chantelle of Dolled Up Design…The season for summer parties and picnic’s is finally upon us and I have a great little idea today inspired by products I used for my daughter’s Snow White themed party last year. 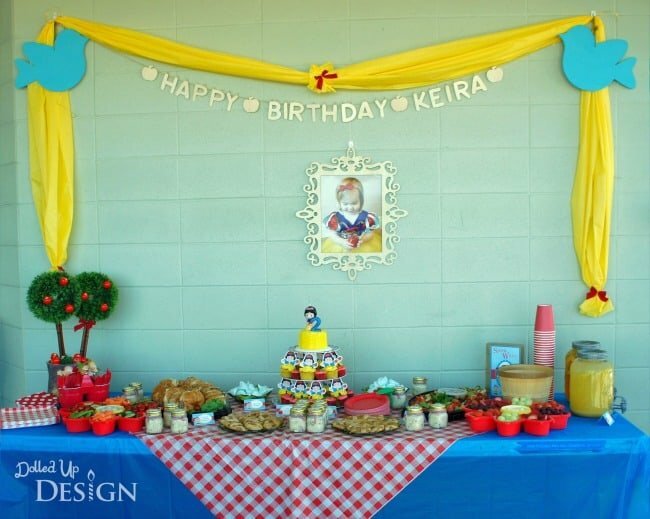 My daughter’s 2nd birthday was held in a local park so I gave the Snow White theme a bit of a picnic spin. 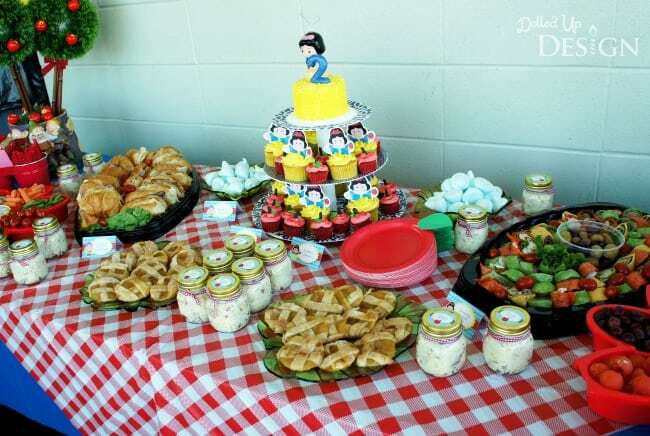 For food, I served a variety of picnic foods including sandwiches, potato salad, apple pie cookies and iced tea. For my younger guests, I decided to prepare individual picnic boxes filled with more toddler friendly foods such as sliced sausage and cheese, goldfish crackers, berries and applesauce pouches. 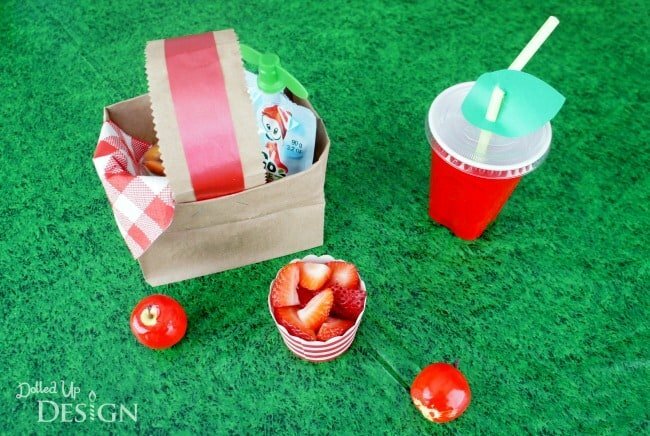 I searched a lot of websites to find the perfect little boxes for my toddler friendly lunches and when I came across these adorable picnic baskets on birthdayexpress.com I just had to have them! They were sturdy, easy to assemble and fit my theme perfectly. 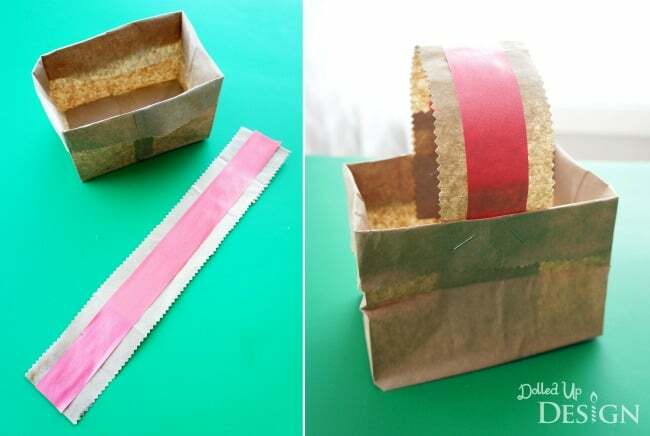 Not long after ordering the boxes, however, I came across the idea to transform paper bags into picnic “baskets” and experienced a bit of buyers remorse. When it comes to parties if there is a cheaper way to DIY something, I usually go that route. 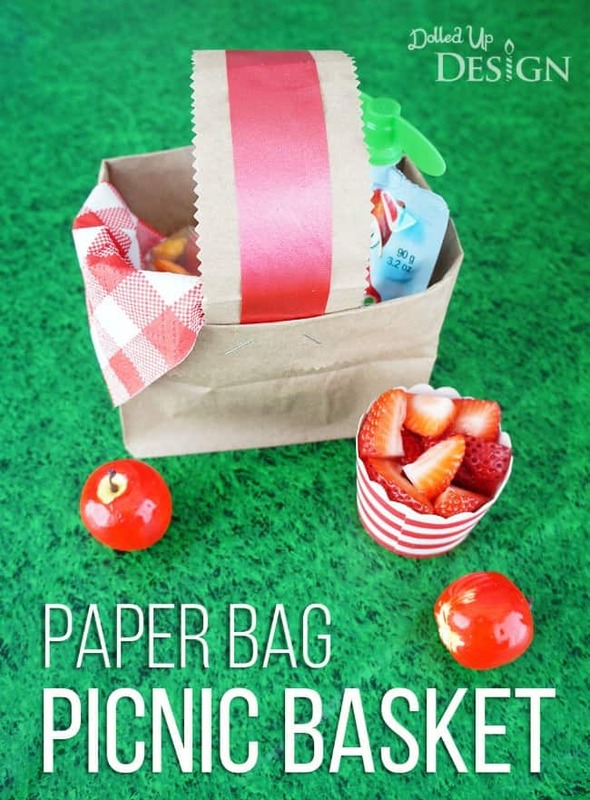 I don’t regret buying the cute picnic baskets, but I will definitely be using these Paper Bag Picnic Baskets for future parties, play dates, or even just a fun lunch with my children. 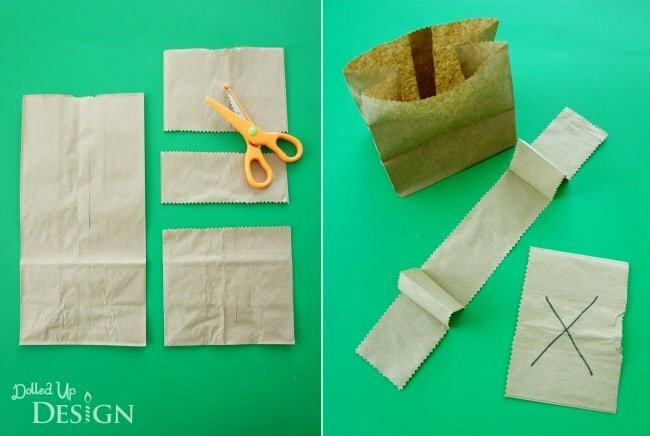 Cut the paper bag in 3 places as shown using scissors. The bottom portion will be the basket, the middle portion will be the handle and the top portion can be discarded. Fold over the top edge of the basket portion if desired. Cut through the loop of the handle portion to create one long strip. Fold over each end of the handle strip and glue to itself to create a thicker base to staple onto the basket. Embellish the handle if desired – I simply glued a piece of red ribbon onto mine. Attach the handle portion onto the basket portion with a stapler. Fill with your food items and a pretty napkin! 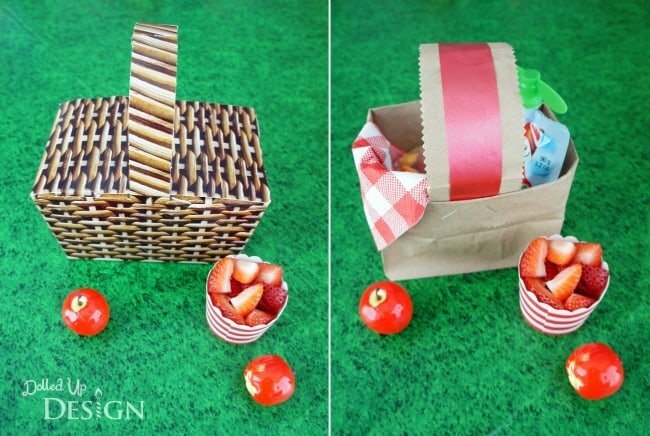 If you are hosting a summer party or picnic this summer, these Paper Bag Baskets are a fun and easy way to serve a meal to kids. The little guests at my party all loved having their own individual basket, and I know most of them proudly took them home with them after the party. I have nothing but good things to say about the boxes from Birthday Express, but if you are willing to get a bit crafty, you really can’t beat the cost of these paper bag versions! And to finish it off, why not give each guest an apple to sip from? 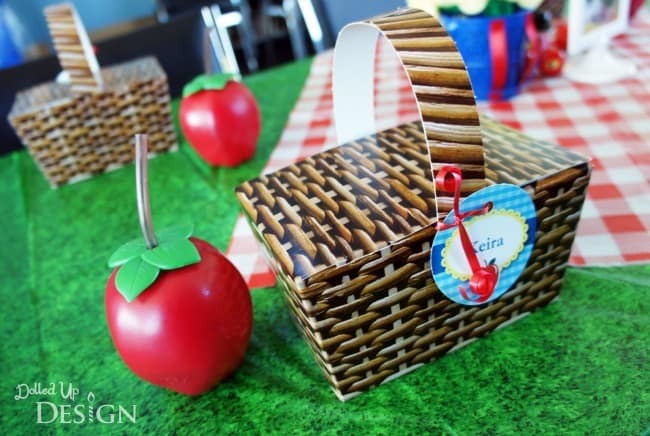 At my Snow White party, each child also received an adorable apple shaped sippy cup with their picnic basket. 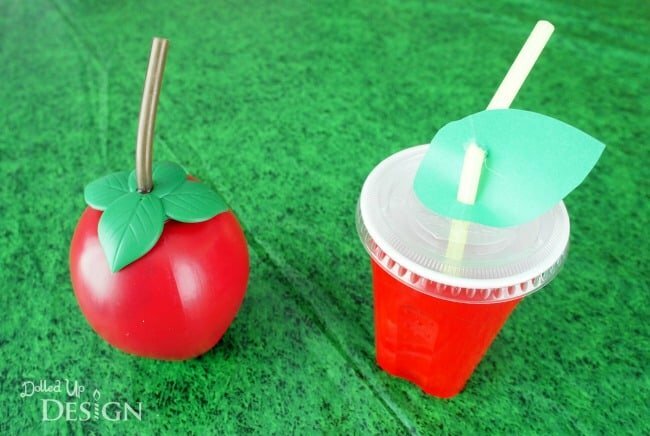 I have come up with a more economical version again here by simply adding a green paper leaf to a straw and inserting it into a red lidded cup. We’d like to send a huge THANK YOU to Chantelle for sharing this fun idea with us. She always has such clever ideas and creates tutorials that are so easy to follow. Have you seen her Olaf jars post yet? Adorable! There are a lot more where this came from – visit her on Facebook to see the latest ideas for fun crafts, party ideas and more! Where did you purchase the apple sippy cups? They’re adorable.. I found the apple shaped sippy cups hanging in the juice aisle of our local Save-On foods. They had orange shaped ones as well. I do believe I have also seen them at Walmart in the past.